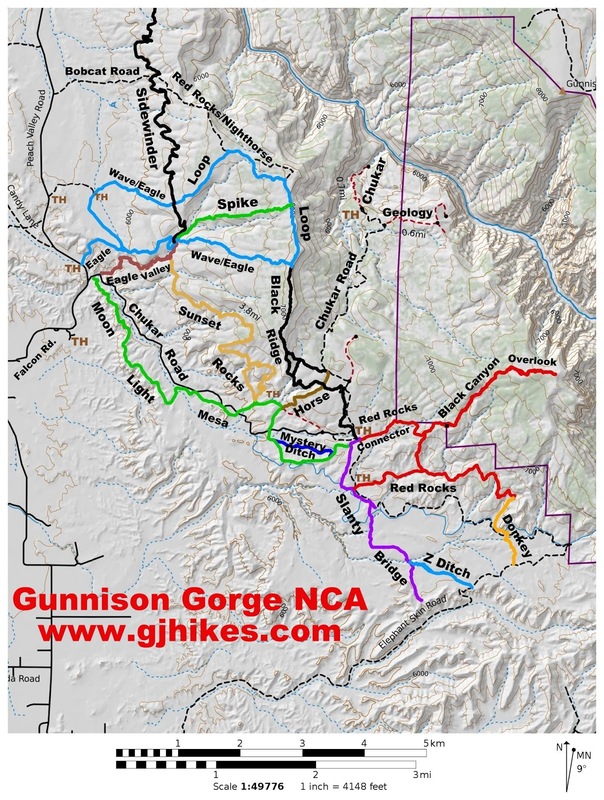 The Donkey trail is located in the Gunnison Gorge National Conservation Area near Delta, Colorado. The trail stretches for 1 mile between the Elephant Skin Road and the Red Rocks trail. The trail provides an alternative route to a short section of the Elephant Skin Road as well as access to the scenically popular Red Rocks area. For this post we are starting at the top of the Donkey trail where it departs from the Red Rocks Nighthorse trail. We arrived at this point by following the Red Rocks trail all the way from the Elephant Skin Staging Area. There is a good view down the valley of the trail from the ridge where it begins. Other than a small hill that cuts across the middle of the valley there isn't much to slow things down. Some hoodoos over on the side of the hill add to the scenery in the small valley. At the lower end of the valley the trail wraps around the hill and begins paralleling the Elephant Skin Road. After a short distance the trail drops the rest of the way off the side of the hill and crosses the road. From there the trail follows a route through some greasewood that takes it to a deep wash where a railless bridge awaits. On the other side of the wash the trail runs a ridge that connects a series of small hills. The final stretch of the trail drops off the ridge and cuts across a small wash. The Donkey trail meets up with the Elephant Skin Road once again and comes to an end. At this point we followed the road a short distance to the Z Ditch trail which we made use of along with Slanty Bridge to get back to the Elephant Skin Staging Area where we were parked. The loop that we did on our mountain bikes was about 7 miles. 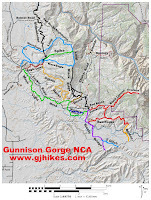 We did another 4 miles on foot hiking up to an overlook in the Black Canyon of the Gunnison National Park where we could see both upstream into the park and downstream into the Gunnison Gorge Wilderness Area. The Donkey trail proved to be a good connecting route to bring it all together. If you would like to see it for yourself then all you have to do is grab your bike or 'Take a hike'.